Dining out, breaking bread, cooking-avoidance… whatever you want to call it: visiting eateries is widely considered a pleasant, social and relaxed experience. Plus, it means no washing up and a guaranteed pudding option. What’s not to like? When two become three and life changes beyond all recognition, be assured there is no need to give up your hobby (is visiting restaurants a hobby? If not it certainly should be), you may just need to make a few tiny adaptions. So without further ado, here’s how to eat out with your little one. It’s still totally worth the money if you have money to burn. Talk with partner about what kind of food you fancy and which restaurant you’d like to visit. Disregard the above as you remember you have a small child, so cuisine and ambience is now irrelevant, alongside any of your personal preferences. Pick somewhere within easy driving distance with quick service, a playground and baby changing. Visit establishment at a time completely unfitting to your appetite. Your usual meal times may be 1 and 7.30 PM but this is of course of no significance. You must fit in with your tiny tot and eat your tea at 4 PM. Upon arrival, make friends with your waiter – their attitude towards your offspring together with speed of service could make or break this bad boy. That you require caffeine so much more than alcohol – order a large Pepsi. Attempt to peruse the menu whilst trying to prevent baby or toddler grabbing it, scribbling on it or eating it. Give up trying and order Burger and Chips. It’s probably what you would have had anyway, if you’d had chance to read the menu. Which you didn’t. Regretfully eye up the steak delivered to the next table before remembering that staring is rude, and so is dribbling when you are an adult. Spend 5 minutes with your partner trying to have a conversation whilst also entertaining the baby and stopping them escaping their highchair. Spend the next ten minutes anxiously looking at the kitchen door. “WHERE IS THE FOOD?” you ask each other desperately. Not that you are actually hungry (it is, after all only 4.10 PM), but you are sat next to a ticking time bomb and don’t have a second to waste. Food arrives, and you carefully cut your child’s food into bite size chunks which they refuse, possibly because of all the raisins you bribed them to stay in their highchair with or possibly because they are being awkward. Give them more raisins. Attempt to eat your dinner as quickly as possible, as your child ups the ante in the highchair escaping stakes. Which reminds you, you should have had steak. You have hiccoughs, your partner has indigestion and your cute little tot has just done something violent in his nappy. Your child demands (via the medium of noisy points) the food from your plate. Supposing it is better than a supper of raisins, give him some burger, bun and chips, with a tomato chunk to make you feel less guilty. Oh, he just wants to throw the food, not eat it. Of course. As your partner attempts to put some distance between the throw-fodder and your child, a violent battle ensues between them, resulting in the knocking over of your Pepsi. According to your tot, this is all your fault and he howls angrily at you, whilst still appearing to enjoy splashing his hands in the huge Pepsi puddle. Your table is a bombsite and the stench of poo covers the surrounding four tables. Get up to change the baby. It is tough to call which is worse: staying and eating dinner amongst all the mess and disapproving eyes, or having to abandon your meal to change the Lucifer of all nappies. Get halfway to the toilet before realising you forgot the baby. A solo loo visit? You wish! It’s a bad ‘un and the baby requires a complete change of clothes. Understandably, he is none-too-pleased about being stripped off in a drafty toilet and in your haste, set off the hand-dryer causing inconsolable tears. Explaining that the noise of hot air is not actually a sinister message from the after-life appears to be of little comfort to your child. Work the vest poppers as quickly as humanly possible (not quickly at all) so you can end the torture for both of you. The hand dryer stops and so does your baby’s tears – hooray. Just as you are getting somewhere – clean nappy, half-dressed child – there is a hammering on the door. “What is taking so long?” someone demands “This is a disabled toilet” you are helpfully told. Believe me friend, you think, I would rather be on your side of the door than mine. But you refrain from shouting this, or hammering back at them. The noise however, has started your baby crying again. Wonderful. Back at the table, your partner takes the highchair-hating baby for ‘a walk’. This consists of preventing him from launching himself at other diners or legging it into the kitchen. You attempt to eat your dinner but after the atrocities of The Toilet Experience, you have no appetite. You have seen too much. Laugh in the waiter’s face when he asks if you would like to see the dessert menu and hastily pay the bill. Arrive home and head for the biscuits, all of this stress and exertion has left you quite hungry. You could really eat a burger right now. So funny! We took our two out for dinner this weekend, and chose a restaurant with very mediocre food that neither adult much cares for. But the kitchen is open at 5pm, they have highchairs and they serve plain cheese pizza which we know Boy-Child will eat: sold! Haha at ‘sold!’ It’s so true that food priorities change completely – we are happy if they have colouring pencils and parking – forget the actual food or service – it’s all about the kids and the convenience! Brilliant! This made me giggle out loud! Love it, every word is true except I always go for the wine as it relaxes me during the experience. Absolutely spot on and I remember it so well it’s scary! Awe thank you! Enjoyed what I’ve seen of your blog too 🙂 Glad I’m not alone in the dining experience! Oh my goodness. This was hysterical, and so completely true! Thank you! SO glad others relate instead of asking, ‘Really? We always have such a perfect, relaxed and sophisticated time out with little Bobby’! I’ve gone for the baby led approach to weaning. We ate out the other day and certainly got some looks! It does get easier. When the baby was about 4 months I took the big one (then 4) to a local cafe for a bit of Mummy time. We had burger and ice cream and chatted about everything. He was a perfect date and it’s a really precious memory. Your posts are always so cheeky 🙂 I totally agree with this one! I made the mistake of going to a restaurant downtown and of course there was no changing table so we had to change a poopy diaper on the floor of a stall! Oye. I’ll stick to what I know from now on. Oh no – I hate it when there are no changing facilities. I guess they are sending us parents a clear message! It’s so rude though. It’s why more often than not we end up at chain type family restaurants that aren’t always perfect food wise but at least are full of other noisy kids and have somewhere to do the (inevitably) poopy bum change! Absolutely Hilarious and Completely True. 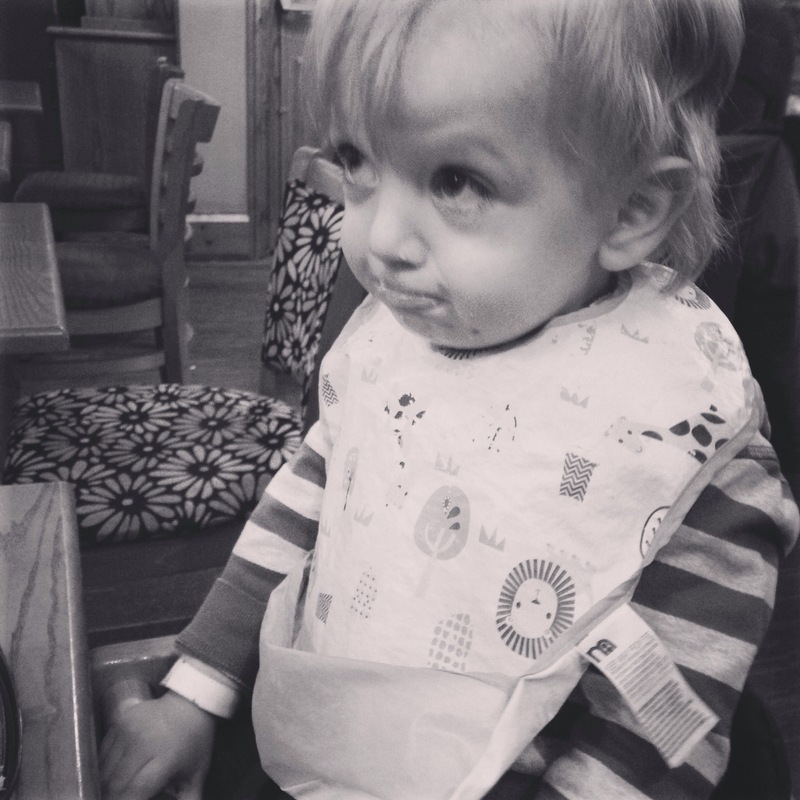 Even when I am without child I still eat at a speed as though someone is going to take it off me… all table manners are out of the window to my own mothers dismay. Thanks for sharing.